By Amanda Glenn 21 Comments March 23, 2018 This post may contain affiliate links. There is a lot of conflicting information out there about what is safe when it comes to breastfeeding and alcohol – some experts say that if you’re sober enough to drive, you’re sober enough to breastfeed. 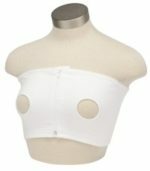 Others say that breastfeeding mothers should avoid alcohol as much as possible. 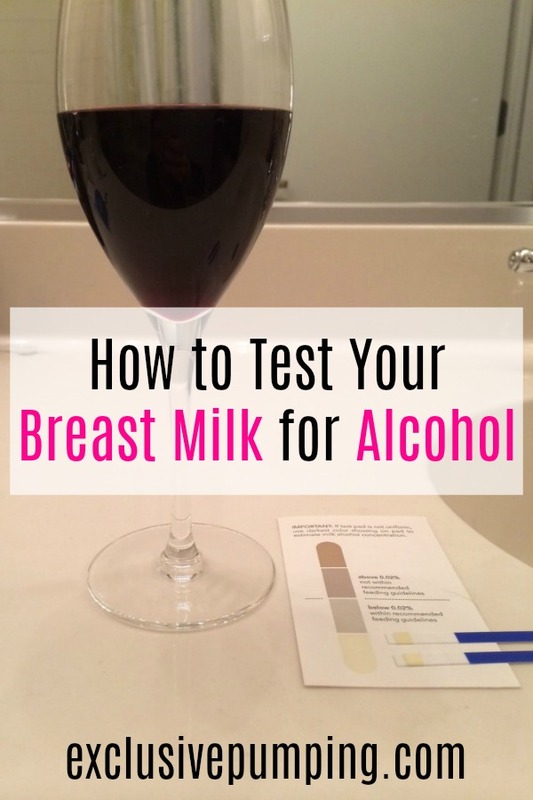 Here’s an experiment I did with testing breast milk for alcohol to see what effect a few glasses of wine had on my breast milk. I don’t drink that much, but a few Fridays ago, my kids were in bed for the night, and my husband was very busy watching Gold Rush. 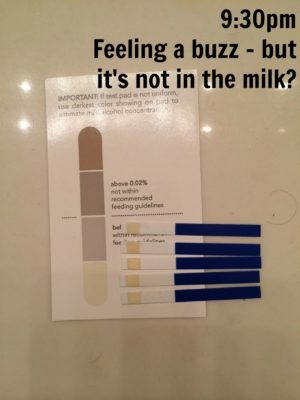 I had found 15 unused Milkscreen breast milk test strips earlier that week while cleaning out a drawer, and I decided to entertain myself that evening by drinking wine and seeing how the Milkscreen registered it. 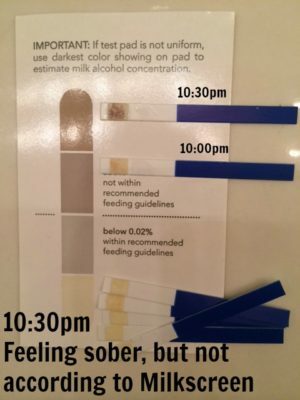 So after I put my daughter to bed, I pumped just enough milk to test in order to get a baseline view of what the strip looked like with no alcohol in the breast milk. As I expected, the color didn’t change and aligned with the “all-clear”/”you’re totally sober!” color on the chart. Over the next hour and a half, I finished that glass, drank half of another one, and tested every half an hour. All of the tests were negative. However, I was feeling the effects of the alcohol enough that I would not have driven or fed my baby at this point. At this point, I was starting to become concerned that the Milkscreen tests were expired, or for whatever reason, just not working. 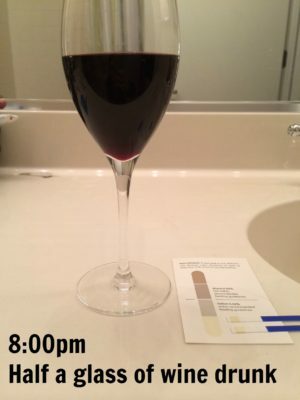 At 10:00pm, though, I finished my second glass of wine, and FINALLY saw a change in the test. I took another one at 10:30pm, which you can see is even darker. I found this sort of alarming, as I’ve always believed the “if you’re sober enough to drive, you’re sober enough to breastfeed” guideline. When I took the last test at 10:30pm, I felt absolutely fine to drive and would have done so. (After all, I’d had two normal-sized glasses of wine over three hours after a full meal, so I should have been fine.) However, this was when the alcohol was strongest in my breast milk. I wanted to stay up and see how long it took for the milk come back out of my system, but my baby likes to be awake to see the sunrise and I needed to go to bed. 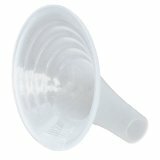 What did I learn from this experiment testing breast milk for alcohol? It surprised me, in that the hours when I wouldn’t have breastfed, it would have been fine for me to do so – and when I thought I was fine, I wasn’t. This doesn’t really change anything for me as a practical matter, since I don’t drink that much and when I do my daughter is already in bed for the night. However, in the unlikely event I have a third baby I will be much more diligent about testing my milk if I decide to have a drink. What do you think? 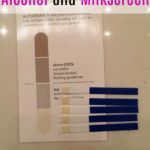 Have you used Milkscreen breast milk alcohol test strips? Do you find it helpful? I had one night where I had drank 4-5 craft beers (so higher alcohol content, about 8-9%) over a 5 hour period. I had gone to bed, and I then pumped 6 hours later after my last drink and thought for sure I would have alcohol in my milk and would have to dump it. So I decided to get some strips to test it and I was sure glad I did. My milk was ok for my baby to drink. And I had enough for more than two feeding. I even tested it twice just to make sure. im not at all surprised by this-i would think there would be a delay-if you think about it, you drink alcohol, your body absorbs it through the mucous membranes in your mouth and osophagus, then stomach, your body processes it through the liver and THEN ends up in your breast milk (after traveling around in your blood) after some time-all of that absorption and processing your body does take a decent period of time! I would be interested to hear what the test strips registered the NEXT morning-I think people would be surprised-especially if you haven’t breast fed during the night-I think you would find that alcohol wouldn’t just disappear/dissipate/evaporate from the breast milk over time (overnight), Potentially accumulating in the breast milk during the night, and quite possibly giving your baby a fair a bit of alcohol for their first morning feed-quite scary to think about!!! I’m curious, did you test your milk the next morning to see if there was any alcohol left in the milk after several hours? Hi Erika! I didn’t – that would have been a good idea though! It makes sense to me that the level in your milk went up as time went on, even if you weren’t feeling the effects anymore. It takes time for the alcohol to metabolize, and to transfer to your milk. So by the time you were buzzed, it was just starting to make its way and after you stopped, the previous wine you had imbibed was now being transferred to your milk. Interesting experiment! For the life of me, I cannot find this excellent article online that mathematically figured out exactly how much alcohol transfers into breastmilk. 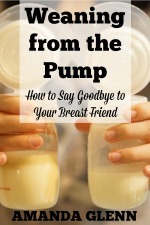 It made perfect sense and the point it was making was that in moderation, very little alcohol transfers into breastmilk…making it unnecessary to pump and dump. I personally have never pumped and dumped…but I do limit myself to one beer or glass of wine. Thanks for your article! I thought I commented on your comment, but now it seems to be gone? 🙂 In any case, that article sounds awesome! If you happen to find it definitely let me know. 🙂 You’re smart to limit yourself, there is nothing worse than being hungover with a baby to take care of! Yes, you had commented on my comment! 🙂 But thanks for commenting again! Enjoyed your brownie blog! 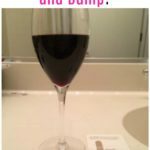 Pumping and dumping is not necessary at any point, and doesn’t help clear alcohol, only time does that. Thanks for the article! The article says that pumping and dumping does not speed the elimination of alcohol from the body, which is obvious to me. That concept never occurred to be. However, I was under the impression that women pumped and dumped at the next feeding/pumping session after alcohol consumption, to avoid feeding baby the milk with high alcohol content. I am comforted that baby is exposed to only a fraction of alcohol that mother consumes, but the research on motor development and sleep patterns is certainly alarming for me! Thanks again for the information! Yes – this is what I have done. 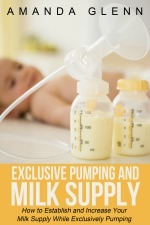 I never liked to mess with my pumping schedule, so if I had had too much to drink to feed my baby, I would still go ahead and pump and then just dump it. (Versus skipping the session altogether.) I would always get too nervous about supply and/or clogged ducts. Thanks! That makes sense! Of course my paranoid self is now worried about impairing my baby’s motor development! I think this is just one of those topics that really has varied research, opinions, etc. So, a couple concerns I have with this post. First, judging from the size of that glass, you did not drink 2 servings of wine. A serving of wine is considered 5 ounces. I’m guessing that wine glass holds closer to 8-12 ounces easily. It takes about an hour to process the first serving of alcohol. It takes an additional hour to process each additional serving of alcohol, and each serving actually slows alcohol metabolism by about half. 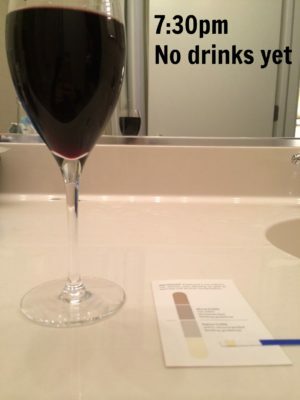 So, if you drank, let’s say, 18 ounces of wine, that would be about 3 servings, maybe closer to 4 or 5 depending on the actual number of ounces your wine glass holds… Which means that you should NOT have been driving 2 hours later, feeling “fine” or not. Your BAC would be at peak about 3-4 hours (if it was 3 servings) after you started drinking. This is why public health advocates strongly advise against having a “glass of wine” at dinner and then driving just a couple hours later. You may feel fine, but the effects of alcohol happen first on judgement and reflexes, and only later on motor coordination and speech. I’m glad you did this experiment, though, because it’s a perfect example of how people get into trouble. You *think* you only had 2 drinks, and act accordingly, when in fact you’ve had quite a bit more than 2 drinks. I wish schools and public health officials had a better way of making sure people actually know how this stuff works, because then you would not have been surprised. Thanks for your comment! I was interested in what you said, so I checked the wine glass. It holds six ounces of wine. (I totally understand how it might have looked bigger than that in the photo because of the angle I took it at. I didn’t want to be in the photo so I crouched down while taking it, pointing the phone upwards.) If five ounces is a serving, then I drank 2.5 servings over a 3 hour period. I definitely understand your point about drinking and driving. It’s not something to mess with at all. Thanks for your comment. Those test strips are known for being wildly inaccurate and alarmist. Yes, alcohol may show on the strip, but that doesn’t mean the amount transferring to the baby is bad! It’s less than a drop of alcohol, in reality. So please don’t get hung up on these strips. Kellymom is NOT wrong, if you can drive you’re fine to breastfeed. That makes sense about the amount transferring to the baby. I think Milkscreen shows the alcohol at the .02 level, which is well below the legal limit for driving. Thanks for making that point! So glad you did this experiment. Luckily I always followed my grandmothers advice of having a glass of wine just before or during a nursing session because she said it would take a while for the alcohol to get to the milk and you would have time for it to hopefully leave your system before the next feeding. Makes perfect sense. I only drink on extremely rare occasions and after my youngest is in bed but I’m always nervous about what happens if she does wake up unexpectedly. Thanks for the insight! I love your grandmother’s advice! I agree that that is the best time, and it’s nice and relaxing, too. Thanks for reading!